Meet my new companion and assistant: minnie (shown on left). Treo is on the right, and he will be helping Mom now. I love this little thing (BlackBerry Curve 8310). 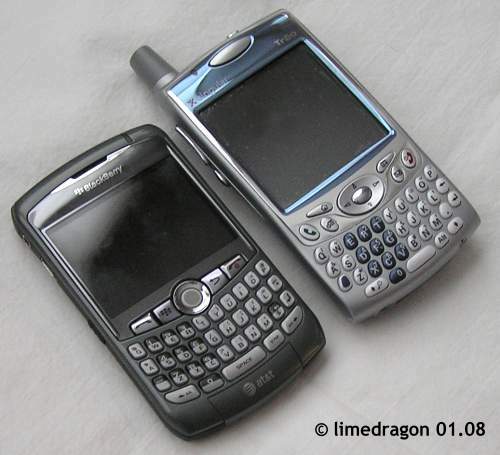 It’s similar in size to the Treo 650, but much thinner and lighter (65 g difference)! I started a new sock on Wednesday night. It’s the current pattern from Sockamania Club KAL. While I love the yarn and the pattern, I’m not so sure this is working out. The yarn is Curious Creek Fibers Omo, a 50-50 silk merino blend. It’s wonderful to work with, but the fabric is VERY drapey and I need more negative ease for these socks to fit well. I have another possible pattern in mind for this fantastic yarn, but I’m going to wait and get Mom to try them on this weekend before I make a decision. I haven’t decided about that sock yet. Yours look very nice, but I guess there is no point if it’s not going to fit well. Congrats on the new gadget! The sock looks good, but like Jeanne said – we can’t feel it, so…. Cool new toy! I like the way the new sock looks, but I know how you feel about drapey socks. I like a nice snug fit. Slouchy socks just aren’t for me. Gadgets, fun! The yarn is pretty but slouchy socks not so much. Love the yarn. I understand about the slouchy, though. I’ve have a pair that is possibly going to be that way. Oh, well. 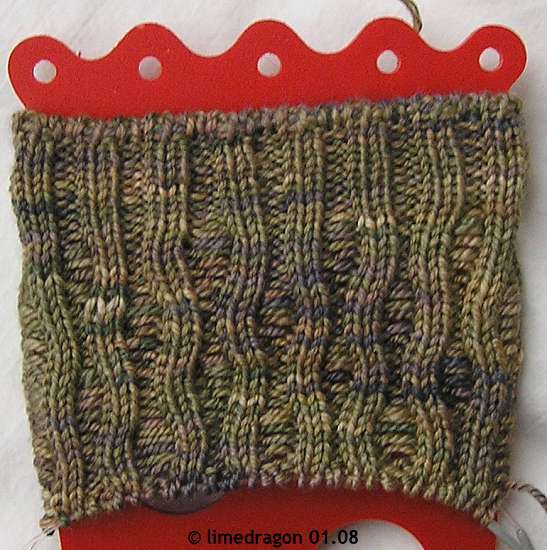 Kelle (Knits and Giggles) is making her pattern up in Schmoochie (sp) It is really nice. Her sock has convinced me to give it a go this month. Congrats on the new Blackberry! I like the looks of the sock but if it won’t fit, I’m not sure it’s worth continuing. I just treade my TREO for a Motorola Q and I do love its smaller size as well…good luck with your new toy. I love the waves, looks cool. Nice toys :) Hope you find something that is right for that yarn – it is very pretty. Dude, your sock is drunk.